Home / Health Insurance Company Reviews / XL Health Insurance America Inc. Although individuals aged 65 and over automatically qualify for Medicare, many recipients need to purchase supplementary medical coverage. Terminally ill patients, people who need to stay in retirement homes and others that simply want an added layer of protection work with companies such as XL Health Insurance America Inc. Although this insurance provider has been in operation for more than a decade, XL Health Insurance America Inc. established its headquarters in Baltimore, Maryland approximately five years ago. Type in your zip code to compare real time health insurance quotes! Recently, XL Health Insurance America Inc. became best known for the Care Improvement Plus Medicare program. Matching recipients of Medicare with health coverage designed to protect them from accumulating additional medical bills, the Care Improvement Plus program attracts health care providers from all over the nation. Some positions require advanced training; however, many individuals have been able to get their start with XL Health Insurance America Inc., in an entry-level position. XL Health Insurance quotes are offered through the Care Improvement Plus online portal. As medical coverage is only available to Medicare recipients that live in the states that XL Health Insurance America is licensed to do business with, consumers are first prompted to select their state of residence. Since traditional Medicare only covers a fraction of a limited range of medical expenses, additional coverage is often purchased by older Americans. Dental plans, prescription drug coverage, and long-term medical care insurance policies can be purchased from XL Health Insurance America Inc. The Care Improvement Plus program appeals to Medicare recipients that specifically need coverage for chronic and debilitating illnesses. A total of seven complaints have been filed by XL Health Insurance America Inc., customers via the Better Business Bureau. XL Health Insurance America Inc. is not BBB accredited. 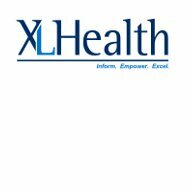 No consumer complaints were found online regarding XL Health Insurance America Inc.
Press releases from XL Health Insurance America Inc. indicate that the company is growing. New employees are being hired and new locations are being opened. It is not known how satisfied existing staff members are, however, no negative reviews from current or ex employees were located. XL Health Insurance America Inc. does not work with independent insurance agents as this company is contracted with the federal government. Medicare patients are able to buy supplementary coverage directly through XL Health Insurance America Inc., in-house insurance agents. All insurance agents hired by XL Health Insurance America Inc., have to be licensed and trained according to the states that they work in. These insurance agents are able to write policies for new clients in order to supplement their Medicare coverage. Although XL Health Insurance America Inc. only sells supplementary Medicare coverage, this company offers several different products. Chronic illness coverage protects Medicare recipients from paying emergency medical bills while dental coverage allows policyholders to get dental treatments that they would not otherwise be able to afford. Because prescription drugs can be expensive, XL Health Insurance America Inc. also has affordable dental plans. This company also offers different supplementary insurance products for low-income Medicare recipients. Review your online health insurance options by entering your zip code now to see health insurance quotes immediately!